Among the unsurpassed beauty of the the strand and the sugar sand beaches of bay colony sits the castle by the sea. 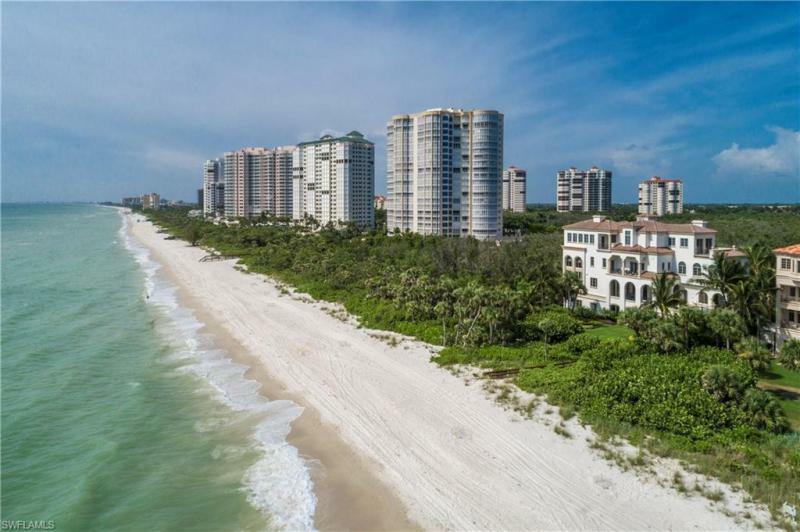 Steps from all the amenities of the private bay colony beach club and the ritz carlton beach resort, this homes offers all the best that naples has to offer. Exclusively set among 12 private residences, this private, secure home and gated community sit directly on the gulf of mexico. This four story estate has all the exquisite finishes and amazing views to match from every level in this home. With endless views out and over the infinity edge pool, your views will never disappoint. Classic architecture, a large gourmet kitchen, wine cellar, and endless outdoor and entertaining spaces. The garage accommodates parking for five vehicles with ample storage for water toys as well! Come see the best that naples, pelican bay and bay colony beach has to offer, your endless sunsets await! H. 8606 - this extraordinary beachfront estate embodies all the luxurious qualities that one would expect to find in a home of this magnitude plus much more. Offering 129 of beach frontage this 10,345 s/f residence was recently renovated with such enhancements as a state-of-the art clive christian kitchen and luxuriously updated sumptuous master suite with sweeping views to the south, fireplace plus office/sitting room. Designed by david humphries and built by kurtz homes in 2002, this estate is finished with a warm understated elegance and quality expressed in light marble and mahogany floors, coffered ceilings and maple millwork detailing throughout. Other highlights include living room with hand carved mexican limestone fireplace, two story formal dining room, summer kitchen and beach side pool. Additional features include a 4,000 bottle wine room, home theater with crestron system, library with two-story beamed maple ceiling and fireplace. Set against a dramatic gulf of mexico scene that permeates the entire house, this masterfully crafted residence is undoubtedly one of the crown jewels on the coast of naples. Coastal contemporary gulf-front estate with 132 feet of pristine beach frontage, expertly recrafted by bcb homes in the strand at bay colony, naples most exclusive gated enclave. Breathtaking vistas of the gulf of mexico and preserve. Beautifully designed grounds with manicured lawns and lush gardens. The 7,342 sq ft furnished residence includes 5 bedrooms, 6 bathrooms, spacious living and dining areas, gym and media room on 4 levels. Bright and airy throughout, with floor to ceiling windows, custom millwork, tasteful marble and wide plank hickory floors. A gourmet kitchen features quartz and mahogany countertops, custom cabinetry and chefs appliances. The family room and breakfast area open to a gulfside pool, outdoor kitchen and covered dining. The 4 en-suite guest quarters, including a private cabana, offer unparalleled luxury for visitors. A full floor master suite features oversized sleeping area, fireplace, breakfast bar, marble bath, custom closets, and office. Hurricane doors and windows. World-class amenities include restaurants, gym and spa, tennis courts, and optional golf club membership. Arguably the most stunning beachfront home available in southwest florida. An architectural masterpiece in the heart of bay colony. This estate home created by jeff harrel and masterfully crafted by kurtz homes boasts unparalleled specifications. Nestled into the most desirable estate site in the shores with unsurpassed lake views. The impeccable interior captures the ultimate in custom finishes throughout. Encompassing 7,500 square feet in the main home featuring beautifully scaled sun-flooded living rooms for entertaining in addition to a spectacular library and culinary kitchen with butlers pantry all leading to the outdoor living area with fireplace, sensational pool, spa and all-inclusive features of a world-class resort. The breathtaking master suite with its own sitting area, fireplace, fitness room, his/ her own private baths plus three additional suites offer comfort and privacy for all. A secluded guest retreat tucked on its own featuring a kitchen, hobby room and two balconies. The private cul-de-sac setting and the circular drive share the impressive gated entry into the exclusive motor court, a minimum of six expansive garage spaces, brick pavers and colorful bougainvillea creating a charming ambiance throughout this estate residence! Perfectly situated within the gates of bay colony shores will sit the latest masterpiece of alan fraser homes corp. Designed by harrell & co. Architects, meticulously built by bcb homes inc. , and beautifully appointed and furnished by godfrey design consultants. Derived from the architecture of the dutch west indies and infused with a contemporary palette, jeff harrell and lauri godfrey have blended these concepts perfectly. Fantastic great room floorplan opens on to the gracious terrace, covered outdoor living and pool area flanked by a separate guest master suite/cabana; an architectural highlight. The mood is casual with an organic feel achieved by the 10 warm, oak floors and framed with creams and deep blues all set aglow with the abundance of natural light afforded by the southern exposure. Completion october 2020. All of this located in one of the most sought after private beach club communities in florida; bay colony. Visit: https://bay-colony. Org/web/pages/beach-club. Goodness based estate living. A magnificent residential masterpiece that rests on 3. 3+ acres of lush landscaping imparting a sense of solitude in this estate setting that affords a level of privacy seldom found. Featuring a meticulously remodeled master, family room, guest home, rear yard, pool, spa & tennis court. The grounds also include a private lake, stunning manicured palms, hardwoods & privacy hedges. Old world renaissance starting at the double 10' solid honduran mahogany doors leading into the grand welcoming-room that the term foyer would not begin to do justice. Architectural elements of superior craftsmanship are displayed in groin vault, coffer, barrel, & beamed ceilings embellished with florentine hand-painting, faux finish details & elaborate chandeliers. Floors of imported marble, stone, & hardwood transition the elegant spaces. Amenities include an extraordinary wine cellar, media game room, gourmet kitchen, butler's pantry, his & her studies, luxurious 2nd floor master suite with his/her baths & exercise room. Outdoor gathering & entertaining with summer kitchen under expansive covered loggia with areas for relaxing & dining outdoors. Best neighborhood in us. Tucked away inside the gated enclave of georgetown, pelican bay is this architecturally inspired new construction estate home nestled on the golf course. With a soft contemporary design, this 6,150 square foot under air masterpiece will leave you in awe. Boasting 5 spacious, en-suite bedrooms and a private office, 7 bathrooms, 4 living spaces, 4 dining spaces and a highly-coveted open floor plan with privacy options throughout. With artistically exceptional ceiling details, quality craftsmanship, custom cabinetry, and the stunning views of the 50-foot pool and golf course. Furniture package provided by calusa bay design available for separate purchase. Ideally located, just moments from waterside, artis-naples, mercato, and the beach. Pelican bay offers a truly compelling list of lifestyle features: 570 acres of mangroves and estuaries, 43 acres of parks, recreation areas, beachfront facilities and boardwalks, three miles of private beach with beachfront dining, 27 holes of championship golf and 18 hartru tennis courts divided among two complexes. The brand new, state of the art two-story clubhouse provides enhanced experiences for members in all aspects of dining, golf and social. Undoubtedly one of the finest waterfront homesites in the shores located within the prestigious gated community of bay colony. This stunning home with commanding curb appeal has been extensively and impeccably renovated and is completed in a subdued casual palette. With 6,353 sq. Ft. Of inside living comprised of 5 bedrooms, 6 full and 2 half baths, office, family room and 1,400 bottle climate controlled wine cellar. The attached 2-story cabana has 2 bedrooms, 2 baths, its own private entrance plus a screened leisure area. The kitchen is a chefs dream that opens to the large family room and breakfast area. 2nd story master retreat with elevator boasts his and her baths with custom closets and its own balcony to view the beautiful sunsets. For your lavish outside entertaining, you and your guests will thoroughly enjoy the large pool, spa, outdoor kitchen with sunshades. This home is a must-see! Please see the attached list of renovations. Classic elegance exudes from this new residence by werchek development. Gracious and warm lines & design that transition from the exterior to the interior. Superbly private near 1/2 acre lot with tropical lansdcaping to capitalize on views & surroundings. Penned by mhk, the fllor plan creates luxurious yet cozy environs for both everyday living & entertaining. Divine master suite with: adjacent sitting area overlooking pool & rear grounds; sun-drenched zen spa bath; in-suite juice / morning bar; full laundry; dream master closets - hers a sensational 14' x 16' replete with huge island & custom cabinetry and his 12' x 8' with handsome custom cabinetry & finishes. Grand central core of home with living, dining, and kitchen flowing onto each other. Unique combo glass enclosed wine cellar & wet bar central to core. 26' of euro doors opening onto outdoor kitchen, pool and & views of resort executed lighting and multiple fire features. Guests will not want to leave the inviting main floor guest casita with sitting area, walk-in closet, & deluxe bath. Back hall / mud room with 2nd laundry, walk-in pantry, & cubbies. 2nd floor. 4 garage stalls. Much more & simply divine! As of today, 4/21/2019 the average home price for homes for sale in Naples is $911,110.